TWO new mobile libraries are set to take to the road soon and will be offering more than just books. The new vans are “on order” and, as well as offering a selection of books, will give people a chance to get online and use computer services. They will replace the existing vans and are said to be better equipped to deliver services. They are due to take to the road in the next few weeks. Details of the new vans were given at a meeting of Cornwall Council’s neighbourhoods overview and scrutiny committee which was discussing a review of the council’s mobile and micro library service. Edwina Hannaford, Cabinet member responsible for libraries, said: “This review is not about cutting the service, we want to plan our resources and put them in the locations that need them. 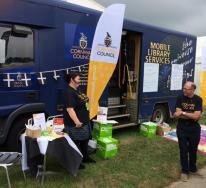 The two mobile libraries operated by the council stop at 155 places around Cornwall and in 2017 loaned out 51,662 books. The council’s micro libraries issued 4,603 books in 2017. It has been suggested that the council could work with more organisations to run services from the mobile and micro libraries including the Department for Work and Pensions, Cornwall Fire and Rescue Service and the NHS. In the review the council wants to ensure that residents who might not be able to access library services can use them. The council has said it may need to look at the use of some of the services and that new micro libraries could also be considered. Users will be consulted during the comprehensive review which is expected to take between 15 and 18 months to complete. However Councillor Jackie Bull was concerned about the cost of the review with a report to councillors saying it would cost £238,000. She questioned what that money would provide that could not be done using existing staff at the council to carry out the review. The committee agreed that the review should be undertaken. The funding details will be confirmed by the cabinet in due course.